Friday was our performance at the PEX Heartburn party. The party took over the Electric Factory, complete with a heated outside tent and Ferris wheel. Members of West Philadelphia Orchestra were there, playing in the hallways and outside, basically wherever they could fit. There were some bagpipe players (with a drum) wandering around as well. They were pretty funny to watch on their breaks, lots of looking around and “How on earth did we end up here?” on their faces. Inside were a bunch of different themed areas, with DJs and aerialists and other general party happenings. 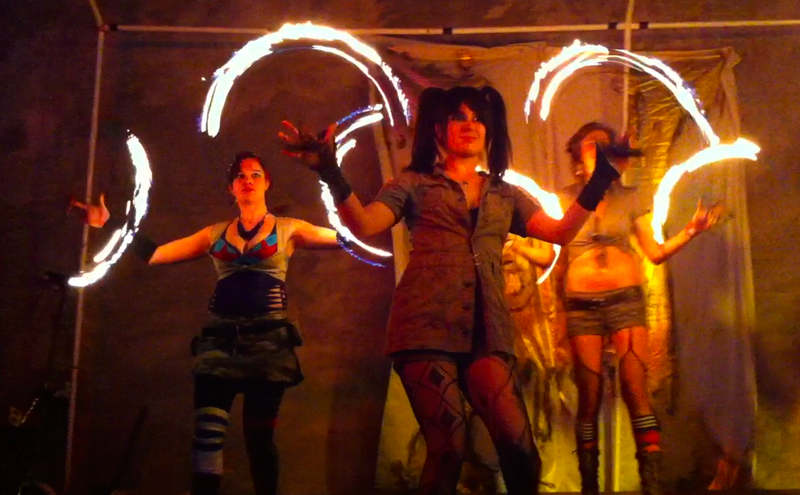 The fire spinning area was outside, near the Ferris wheel, with a small open area to watch from inside the tent. Originally scheduled at 11, our performance slot got moved to 1:30 in the morning. The weather report didn’t look very good. Alternating between freezing rain and snow, yippee! Sure enough, it was raining the whole night. And very very cold. Our fuel dump area was underneath a big truck, and we had to be careful to make sure all the props stayed nice and dry-ish. The one good thing about the rain and cold? It turned everything into such confusion that the performance was completely low stress. Cause when everything is already going wrong, how bad could it possibly be? It was the first time I wasn’t shaky going “on stage”. Perhaps because there was not stage…. it felt just like our rehearsals, with a bit more hooting and clapping. And the fan bit that I’ve been crazy anxious about?? I didn’t drop them!! They were super hot, perhaps because of the humidity, but I still ran through the whole routine without freaking out. Yay! Tim got some video of it, so once he gives it to me I’ll be able to see how well I did with the actual choreography, but as far as the performance… felt pretty solid to me. Or, as solid as fire spinning in a wet parking lot in front of a huge truck in the freezing rain can be. Still waiting on the video, not sure who has it or what state its in, but Will Connelly got some great shots of our performance… I hope he doesn’t mind if I post them here. (Follow the links! Check out his work! He’s rather good!) If you get to this page, Will, and want me to take them down, just let me know. I have to be honest, I sort of cringe when I look at these… not because I’m in them, but because I see all the little bits that are kinda off that I’d like to fix. Photos of performances always do that to me. Once I see the video I usually realize that all the little things I nitpick aren’t really that noticeable, but till I see that proof…. ugh, I agonize over the detail I barely remember. Its funny how a performance is over so quickly. We spend so much time preparing, practicing, making costumes…. and it is over in under 4 minutes. I think the flu is officially kicked, and Jes and I rocked out at the Hipnosis hafla. I’m really glad that we chose the song and costumes we did. It was so silly and fun! Eventually I’m sure I’ll post up the video, but till then… I have a few photos of our costumes posted over on flickr, but none really catch the petticoats or the hoods that really upped the cute-ness of our tops. It seems everyone is so serious at these performances, and we really wanted to just laugh and have a good time. What better than a fun song and some silly costumes to make people smile? I’m exhausted but happy, and I hope we brightened a few people’s evening. Still haven’t gotten the CD with our ‘official’ photos, but a friend Laura made (Karen, aka Safiradance) took a bunch of us while performing. Jes is hiding behind me in this one…. formation, ladies! We’re settling in to practice every thursday which should be great for us… some time to focus on technique and dancing together as a cohesive unit. It was such a great weekend, but it is nice not to have the pressure of a looming performance for a while. The tribal dance troupe I’m a part of (Rag Tag Tribal) had our second performance yesterday at “Purim Palooza!” We did two songs, and I felt like I fumbled up quite a bit, but it was still fun. There was a bit of a snafu with the music (we ended up in position, waiting for it to come on for far too long….) but it all turned out ok, and I think our performance was well received. A big thanks to Ariel with the Jewish Graduate Students network for inviting us to perform. More photos and info can be found over on our troupe site. Yeah!!! First performance! I think it went well. Have to wait for the video to see what it actually looked like, but as nervous as we all were (shaking!) we got tons of compliments. I think we looked great, and it was a lot of fun, as terrifying as performing in front of people is.